It’s Wednesday and that, apparently, means talking about WIPs. I have 4 active WIPs currently. Grandma’s sweater with Sirdar Crofter, my Berry Leaves sweater with Mirasol Qina, Cassie’s Pullover with Sandnesgarn Mandarin, and Lisa’s Playmat with Lion Brand Homespun. Having recently finished a pair of socks and a shawl for myself I decided it felt good to knit for myself. I also have a lot of gifts and commissions to do as well though so I have a schedule for my WIPs. Right now I am on a 3 ptoject rotation but Grandma’s sweater (not being needed until January) is not included right now. My rotation is day 1: Berry Leaves, day 2: playmat, day 3: pullover, day 4: playmat. This way the playmat, which is largest and most pressing, is worke on every other day and my sweater and Cassie’s pullover get equal time. I’ve made amazing progress on my sweater, I am almost done the bust increases on the back. Cassie’s pullover was doing pretty well until I messed up and ended up with a big hole somewhere that I didn’t know how to fix. The playmat has 2.5 animals done. The sheep will be the death of me because the body is almost entirely bobbles! 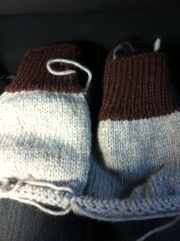 Luckily I am done the bobbles part now so it should be faster knitting from here. Grandma’s sweater has one front that will need to be fixed (neck issues) and most of the back. Since I did it in one piece to the armholes it has most of the second front too. I decided to give my finalnopinion on the Google+ KAL since I’m totally done my shawl. I loved the pattern, I was informed there were errors but the one part that was supposedly wrong looks fine to me and the other areas I seem to have been able to work through just fine. One problem I had with the process was that my stream is filled with all kinds of stuff that I really have no interest in. That isn’t just because of the KAL but some of the people posting EVERYTHING as totally public are from the KAL people. The best part of the KAL though is seeing everyone else’s shawls. They are all beautiful and everyone has done a great job with them. It’s interesting to see the finished shawls show up in all colours and sizes. I could see myself doing this again in the future. It was a lot of fun. I wanted to add pictures to this but didn’t get time to so since it’s Friday and I wrote this 2 days ago, I’m posting now. Hi, my name is Sarah and I’m going to give this a try to see if I like it better than what I was using. This first post won’t be very interesting because I’m just saying Hi! So to tell you a little about myself. I’m 23 and living in a tiny basement apartment with my boyfriend and our 3 furbabies; 2 cats and a dog. I love knitting and am desperately trying to design my own patterns. 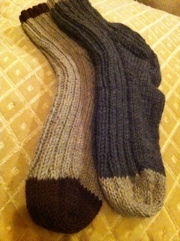 I just finished a couple socks that I did without a pattern. I’m going to finish 2 more then get the recipient to try them and tell me what he thinks. Feedback from my mom so far has been the legs are too short. We’ll see what he says when he tries them. This was my first attempt which I didn’t like so I pulled it all out and started again. These are the ones that are finished as of now. I am currently working on the matches to these.